Harrington, Ocko & Monk is pleased to announce that Erin Durba has joined the firm as a senior associate in the Commercial Litigation Department. She comes to us with a significant amount of litigation experience after spending the bulk of her legal career at Proskauer Rose where she handled complex commercial litigation disputes involving a wide range of subject matters including insurance coverage, breach of contract, fraud, real estate, bankruptcy, securities, broker-dealer and white collar criminal cases. Erin received her J.D. from Columbia University School of Law, and was both a James Kent and Harlan Fiske Stone Scholar. Erin received her Bachelor’s degree from Loyola University. Harrington, Ocko & Monk is pleased to welcome back Julie C. Hellberg to the firm. Julie has returned as an associate in the Insurance Defense Practice Group after working as a defense attorney in a large in-house counsel firm for the past several years. Julie’s defense experience includes all manners of tort defense including construction site accidents, premises liability, products liability, civil fraud, and automobile actions. Harrington, Ocko & Monk, LLP is also proud to announce that Kevin J. Harrington and Glenn A. Monk were selected to THE TOP 25 list of attorneys in Westchester County, New York and Kevin J. Harrington has been selected to THE TOP 100 New York – Metro Super Lawyers list. The firm would also like to congratulate Matthew R. Bremner and Julie C. Hellberg on their selection to the 2018 New York Metro Rising Stars list. Harrington, Ocko & Monk, LLP proudly announces that the firm has again been selected to the 2018 New York Metro Super Lawyers list based on, among other things, peer recognition and professional achievements. Each year, no more than 5 percent of the lawyers in the state are selected by the research team at Super Lawyers to receive this honor. Harrington, Ocko & Monk, LLP congratulates its founding partners Kevin J. Harrington, Robert S. Ocko and Glenn A. Monk as well as our attorneys Adam G. Greenberg, I. Paul Howansky, Melissa Cintron, Dawn M. Foster, Michael W. Freudenberg, John T.A. Rosenthal, Joan S. Silverman and Barry N. Seidel for their selection to the 2018 New York Metro Super Lawyers list. Harrington, Ocko & Monk, LLP is proud to have taken part again in the “100,000 Thank Yous” initiative sending thanks and best wishes to our troops overseas. Melissa Cintron, a partner in the general liability and corporate and commercial real estate practices, participated in the Rising Phoenix Center for Law & Politics 1st Annual Girls Rule the Law Program, in collaboration with the New York City Bar Association. The event, geared to New York City middle and high school girls, featured judges, mediators, attorneys and local politicians endorsing young women to pursue careers in the government and the law. Melissa was a member of a panel that featured female litigators employed in traditional law firm practices. She shared her insights on lessons learned during her years as a practicing attorney as well as advice for success and advancement in a law firm setting. Harrington, Ocko & Monk, LLP would like to congratulate Matthew R. Bremner, an associate in the Insurance Defense Practice Group. Matthew was the recipient of the NYSBA Torts, Insurance and Compensation Law Section’s 2018 Sheldon Hurwitz Young Lawyer Award presented during the NYSBA Annual Dinner on January 24, 2018. The award recognizes Matthew’s outstanding contribution to the practice of law in the field of insurance. Matthew has contributed to the TICL section through giving CLE lectures on taking depositions and publication of updates on topics including negligent security, premises liability, insurance coverage and New York Labor Law. Harrington, Ocko & Monk, LLP, is proud to announce that Dawn M. Foster has become a partner effective January 1, 2018. Dawn M. Foster has been with the firm for over a decade working primarily in the Insurance Defense Practice Group. She focuses her practice on general liability and other complex litigation, including the defense of construction claims, abuse and negligent supervision of minors in residential care and treatment facilities, premises liability and general negligence claims. She is also a licensed third-party administer and handles claims of general liability and employment-related matters for several clients that range from an assessment of coverage to the resolution of claims. Additionally, she handles litigation matters from the initial pleadings stage to trial, including a significant amount of appellate work in the New York State Appellate Division. Dawn received her B.A. from the University of Delaware with honors and received her J.D. from Pace University School of Law. Dawn has been selected to the Metro New York Super Lawyers List since 2013. 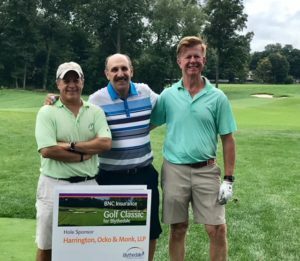 Harrington Ocko & Monk LLP is proud to have taken part in and be a sponsor at the Terrier Claims Services 2017 Golf Outing Fundraiser to benefit our heroes at the National Amputation Foundation. Harrington, Ocko & Monk LLP proudly announces that the firm has again been selected to the 2017 New York Metro Super Lawyers list based on, among other things, peer recognition and professional achievements. Harrington, Ocko & Monk, LLP congratulates its founding partners Kevin J. Harrington, Robert S. Ocko and Glenn A. Monk as well as our attorneys Adam G. Greenberg, I. Paul Howansky, Melissa Cintron, Dawn M. Foster, Michael W. Freudenberg, John T.A. Rosenthal and Joan S. Silverman for their selection to the 2017 New York Metro Super Lawyers list. The firm would also like to congratulate Matthew R. Bremner for his selection to the 2017 New York Metro Rising Stars. Harrington, Ocko & Monk, LLP is also proud to announce that Kevin J. Harrington and Glenn A. Monk were selected to THE TOP 25 List of attorneys in Westchester County, New York. 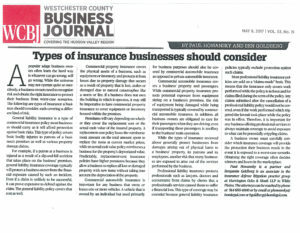 Harrington, Ocko & Monk’s attorneys, Paul Howansky and Ben Goldberg, recently wrote an article on the “Types of Insurance Businesses Should Consider,” that was featured in both the Fairfield County Business Journal and the Westchester County Business Journal. Please see below to read the article and learn more about how business owners can purchase the right insurance to protect their business from worst case scenarios . Harrington, Ocko & Monk LLP congratulates Melissa Cintron and Dawn Foster on their selection to the New York Metro Super Lawyers Top Women List. Harrington, Ocko & Monk, LLP is pleased to announce that Benjamin Goldberg has joined the firm as an associate in the Insurance Defense practice group, where he will handle a variety of construction site accidents, premises liability matters and insurance coverage claims. Ben has handled matters involving personal injury accidents, premises liability, and insurance coverage disputes and has also practiced corporate and securities law and drafted and negotiated contracts and agreements. Ben received his J.D. from Fordham University School of Law where he was a Mary Daly Scholar, a member of the Fordham Journal of Corporate and Financial Law, and a member of Brendan Moore Trial Advocacy. Michael Freudenberg, a partner in the Commercial Litigation Practice Group, was a guest speaker at the Putnam County Bar Association’s Member Lunch Meeting, on February 8th, in Carmel, New York. Michael spoke on developing legal issues involving drones that all attorneys should be generally familiar with. The speech was well-received by the members and likely will be turned into a 2 hour CLE sponsored by the Putnam County Bar Association later this year. Harrington Ocko & Monk LLP is proud to have taken part in and be a sponsor at the 2016 Golf Classic for The Francis Pope Memorial Foundation. The Frances Pope Memorial Foundation strives to offer financial and emotional support to families dealing with the challenges of a sick child. The money raised helps to pay expenses associated with caring for children with cancer that are not covered by insurance and attempts to respond to the unique needs of each individual family. John Rosenthal, Senior Counsel at Harrington, Ocko & Monk, LLP was recently featured in Thomson Reuters Westlaw Journal’s Intellectual Property Issue, with an expert analysis entitled “Bots and the Bottom Line: The Copyright Act and the DMCA.” John shares his view on video game publishers and their ability to protect themselves from malicious software or bots through the Digital Millennium Copyright Act. Harrington, Ocko & Monk, LLP participated in the Westchester County Bar Association’s campaign to support the local not-for-profit organization United For the Troops, collecting snacks, toiletries, and sundries to send overseas to troops serving abroad. Pictured are partners Robert Ocko, Kevin Harrington, and Glenn Monk, as well as Eddie Santiago and John Rosenthal, both Veterans, and Ana Arroyo, a Vet Mom. Harrington, Ocko & Monk, LLP is pleased to announce that Ray Serina has joined the firm as an associate in the Insurance Defense practice group, where he will handle a variety of construction site accidents, premises liability matters and insurance coverage claims. Ray has been an Assistant District Attorney at the Bronx District Attorney’s office in the Trial, Grand Jury and Criminal Court bureaus. Ray has extensively handled witness interviews, motion practice, plea negotiations, and conducted trials.Ray received his J.D. from Fordham University School of Law where he was a member of the Fordham Journal of Corporate and Financial Law and he received his undergraduate degree from Villanova University. 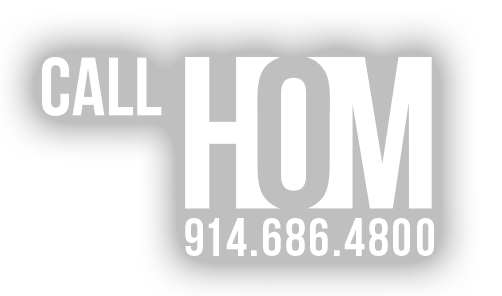 Harrington, Ocko & Monk, LLP partner Michael Freudenberg was recently interviewed by Habitat Magazine and featured in an article entitled “Building Defects: The Power of a Google Search” in the November issue of their magazine. Matthew Bremner of Harrington, Ocko & Monk, LLP, presented at the New York State Bar Association’s CLE program “Bridging the Gap” lecture series on Skillfully Handling Your First Deposition, 10 Tips for Success, which was attended by over 500 admitted lawyers and video-fed to locations throughout the state.http://www.nysba.org/BridgingtheGap/. Robert S. Ocko, Managing Partner of the Real Estate and Corporate Practice Groups at Harrington, Ocko & Monk, LLP represented RSP Group, LLC in the acquisition of 90 South Ridge Street, Rye Brook, New York for $11.1 million from BRG Rye Brook, LLC on April 28, 2016. The building is a glass, two-story, 75,000 square foot, commercial office and medical building. The building is occupied by first class medical and professional tenants. Mr. Ocko has represented numerous commercial real estate clients in multi-million dollar transactions in Westchester and throughout the metropolitan area for more than 25 years. Glenn A. Monk, Managing Partner of the Insurance Defense practice group at Harrington, Ocko & Monk, LLP, was recently awarded the John E. Leach Memorial Award for 2016 in recognition of his outstanding service and distinguished contributions to the legal profession as a member of the Torts, Insurance and Compensation Law Section of the New York State Bar Association. Mr. Monk has more than 30 years of experience as a trial attorney specializing in tort defense litigation. Paul Howansky, a partner in the firm’s Insurance Defense Litigation practice group, recently succeeded in obtaining an affirmed dismissal of a Labor Law 241(6) action from the Appellate Division, First Department. The issue on appeal concerned whether the Appellant, a construction worker with nearly 30 years of experience, could recover for injuries sustained as a result of his own decision to jury-rig and misuse a saw contraption that he knew was unsafe and not designed for the task at hand. The Appellate Division, citing the fact that Appellant worked alone and used only his own tools and equipment, was the sole proximate cause of his accident and that the manner in which the saw contraption was rigged rendered compliance with the Industrial Code sections relied upon by Appellant an impossibility. Harrington, Ocko & Monk, LLP is pleased to announce that Michael W. Freudenberg has become a Partner in the Commercial Litigation Department. Michael also handles other transactional matters and provides outside general counsel services. He has most recently spearheaded the Firm’s Construction Blog as well as being the Co-Chair of the Corporate and Commercial Law Committee of the Westchester County Bar Association. Michael was an organizer, speaker and moderator at the WCBA E-Discovery CLE in February 2015 and intends to present another CLE on the commercial use of drones sometime in late 2016. Harrington, Ocko & Monk, LLP is pleased to announce that John T. Rosenthal has become Senior Counsel in the Commercial Litigation Department. John has played a lead role in developing the firm’s practice dealing with the enforcement of intellectual property rights (under the Digital Millennium Copyright Act) against various kinds of infringement. John is also actively involved in defending clients against lawsuits involving the Federal CAN-SPAM Act which relates to false or deceptive email marketing. 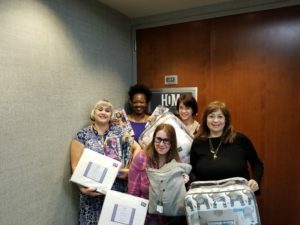 Harrington, Ocko and Monk, LLP (HOM), got into the holiday season this year by donating its time and efforts to two meaningful Westchester organizations, The SPCA of Westchester and The Pajama Program. Each year, the SPCA of Westchester has a Wish List of items needed for its shelter. HOM filled two baskets with needed items from their Wish List to help stock the shelves. HOM also donated goods to The Pajama Program whose mission is to provide One Million Good Nights. The organization holds reading parties for children who can pick out new pajamas and a new book. Again, HOM filled two baskets of new books and pajamas for the local Westchester Chapter. Additionally, Harrington, Ocko & Monk sent holiday cards to the American Red Cross to distribute to wounded American soldiers recovering in various hospitals letting them know their services are greatly appreciated. On December 2, 2015, Glenn Monk and Matthew Bremner of Harrington, Ocko & Monk, LLP, presented at the New York State Bar Association’s CLE program “Bridging the Gap” lecture series on Skillfully Handling Your First Deposition, 10 Tips for Success, which was attended by over 500 admitted lawyers and video-fed to locations throughout the state. In a recent decision, the Court of Appeals in Hutchinson v. Sheridan Hill House Corp., 26 N.Y.3d 66, 19 N.Y.S.3d 802 (2015) reviewed three trivial defect cases and ultimately set forth principles that make it challenging to win on this theory alone. In Hutchinson, the Court of Appeals cited to the Appellate Division, First Department case of Cassizzi v. Fordham University, 101 A.D.3d 645, 957 N.Y.S.2d 856 (1st Dep’t 2012), to reject Plaintiff’s argument that the trivial defect doctrine should be limited to municipal defendants or cases involving accidents on sidewalks. In Cassizzi, the Court affirmed the grant of summary judgment to our client, Fordham University, when the Plaintiff slipped and fell while descending an set of interior stairs within a building on Fordham’s campus. The Court in Cassizzi found that the photographs of the subject stair and the affidavit of plaintiff’s expert demonstrated that the defect in the stair was trivial. Further, the Court found that Cassizzi failed to present evidence indicating that the defect presented a significant hazard, notwithstanding its minimal dimension, by reason of its location, adverse weather or lighting conditions or other circumstances giving it the characteristics of a trap or snare. Glenn A. Monk and Dawn M. Foster litigated the case and Dawn M. Foster wrote and argued the brief at the Appellate Division. Harrington, Ocko & Monk LLP proudly announces that the firm has again been selected to the 2015 New York Metro Super Lawyers® list. Harrington, Ocko & Monk, LLP congratulates its founding partners Kevin J. Harrington, Robert S. Ocko and Glenn A. Monk as well as our attorneys Adam G. Greenberg, I. Paul Howansky, Melissa (Walters) Cintron, Dawn M. Foster, Michael W. Freudenberg and John T.A. Rosenthal for their selection to the 2015 New York Metro Super Lawyers® list. The firm would also like to congratulate Michael R. Wood and Matthew R. Bremner for their selection to the 2015 New York Metro Rising Stars. Additionally, Harrington, Ocko & Monk, LLP is proud to announce that Kevin J. Harrington and Glenn A. Monk were selected to the TOP 25 list of attorneys in Westchester County, New York. Paul Howansky, a partner in the firm’s Insurance Defense Litigation practice group, recently obtained summary judgment on behalf of its client in a wrongful death lawsuit involving a construction worker falling from a roof. In the motion, Mr. Howansky initially established that the accident arose out of the means and methods of the Decedent’s roofing work, not as a result of any dangerous worksite condition. Mr. Howansky then successfully argued that the client, as owner of the building, exercised no supervision or control over the Decedent’s work and therefore could not be held liable under Labor Law 200 or common law negligence. Consequently, we were able to obtain a conditional order of indemnification over and against the Decedent’s employer under both contractual and common law indemnification grounds, thus paving the way for reimbursement of the client’s defense costs. Michael Freudenberg, Co-Chair of the Westchester County Bar Association Corporate & Commercial Law Committee will be the moderator and speaker at the WCBA CLE entitled “Catch It While You Can: Understanding the Duty to Preserve and Collect Electronic Evidence” on Wednesday, February 25, 2015 at Pace Law School.